SAN JOSE, Calif., June 26, 2018 /PRNewswire/ -- Xilinx, Inc. (NASDAQ: XLNX) and Daimler AG today announced that the two companies are collaborating on an in-car system using Xilinx technology for artificial intelligence (AI) processing in automotive applications. Powered by a Xilinx automotive platform consisting of system-on-a-chip (SoC) devices and AI acceleration software, the scalable solution will deliver high performance, low latency and best power efficiency for embedded AI in automotive applications today. 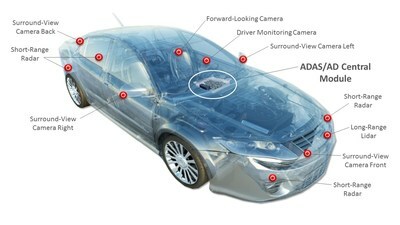 Xilinx has a strong pedigree in automotive. For more than 12 years the company has shipped over 40 million cumulative automotive units to automakers and Tier 1 suppliers. "We are accelerating our product development using AI technology by engaging our global development centers with Xilinx experts," said Georges Massing, director user interaction & software, Daimler AG. "Through this strategic collaboration, Xilinx is providing technology that will enable us to deliver very low latency and power-efficient solutions for vehicle systems which must operate in thermally constrained environments. We have been very impressed with Xilinx's heritage and selected the company as a trusted partner for our future products." As part of the strategic collaboration, deep learning experts from the Mercedes-Benz Research and Development centers in Sindelfingen, Germany and Bangalore, India are implementing their AI algorithms on a highly adaptable automotive platform from Xilinx. Mercedes-Benz will productize Xilinx's AI processor technology, enabling the most efficient execution of their neural networks. "We are proud to announce this collaboration with Daimler on advanced AI applications," said Willard Tu, senior director, Automotive, Xilinx. "Our adaptable acceleration platform for automotive offers industry leaders like Daimler a high level of flexibility for innovation in deploying neural networks for intelligent vehicle systems." © Copyright 2018 Xilinx, Inc. Xilinx, the Xilinx logo, Artix, ISE, Kintex, Spartan, Virtex, Vivado, Zynq, and other designated brands included herein are trademarks of Xilinx in the United States and other countries. All other trademarks are the property of their respective owners.